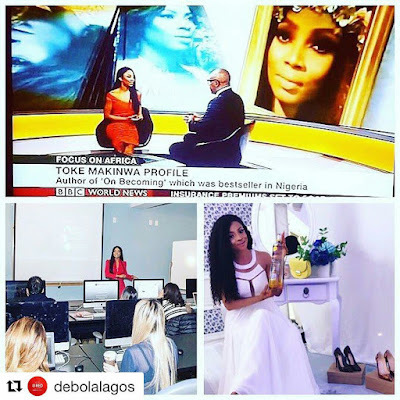 Nigerian radio personality, television host, vlogger, and bestselling author, Toke Makinwa known for co-hosting The Morning Drive on Rhythm 93.7 FM took to her instagram handle few hours ago to share the good news of her becoming the first female Ciroc ambassador in Nigeria. Dear @debolalagos ❤️❤️❤️ #Repost @debolalagos (@get_repost) ・・・ Omotoke Makinwa, Congrats on being the first #Ciroc female ambassador in Nigeria. Flying the flag on @BBC and more and turning your message into purpose at @YALE and several others. Won rope Oti tan,Won rope otipari, Ona Toluwa gbe gba otun wa je ona Iya nu. Ewo, etun wo! Irawo yi o ni bi ton lo tabi ko ma tan lo. Aiye o le pa kadara yo, majemu Oluwa lon gbero .